This is another of the cow paintings that kept me busy all through the month of April. There are five more I'll be showing. 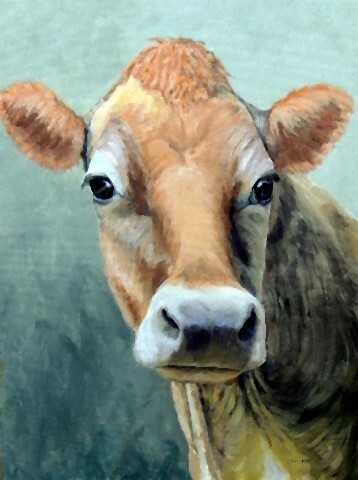 This is a Jersey cow. The original was 30x40 inches and has been sold. Following this past month's marathon, I figured this is a good time to take a new direction in my artwork. So in addition to still doing custom animal paintings, and the occasional animal painting from my own photographs, I am making two very (for me) big changes in my artwork: I am going to be painting primarily landscapes from now on (suggestions welcome! ), and I'm switching from acrylics to oils as my medium. I've been practicing both the new medium and the new subject matter, and there's going to have to be a pretty sharp learning curve for me. It's a whole new field (no pun intended! ), and I'm really excited about it. Please, if you've followed me mostly because I have painted animals for years, stay with me and see how my new work is going. Wish me luck on this new chapter in my painting career. One more thing: For those of you who know of my past ceramic artwork, I am once again making some ceramic animal masks and will be listing them on Etsy within the following few months. There will only be a few each month, approximately 10 per month, because I don't want to make them full-time anymore. But I must admit that I am enjoying the several hours a week I've been spending in my clay studio; it's a welcome break from "my day job." If you have mask requests, let me know and I'll do my best to create something like what you want. I am going to be doing a few different types of animals this time: In addition to the usual dogs and cats (and possibly a few fish), I'm going to be making some cow and rooster masks. Should be interesting.